You are here: Home » About us » 50 Years of Changing Lives! 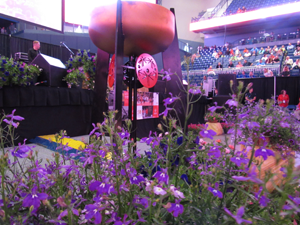 Help Special Olympics Rhode Island Celebrate 50 Years of Changing Lives! 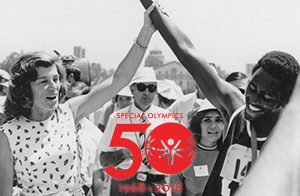 On July 20, 1968, Eunice Kennedy Shriver ushered in a new era for people with intellectual disabilities, when — with 1,000 athletes from three countries — she opened the very first Special Olympics International Games at Soldier Field in Chicago. Special Olympics Healthy Athletes Program has grown into the largest worldwide provider of health services for people with intellectual disabilities. In Rhode Island, we provide various Health Screenings at our State Summer Games and our yearly MedFest. Special Olympics Young Athletes Program now reaches children as young as 2-years-old, providing social and motor skills development and encourages parents and siblings to get involved in the activities. Unified Champion Schools is building stronger, more inclusive school communities and fighting the bullying that is prevalent against our population. In Rhode Island, there are 39 High Schools, 37 Middle Schools, 41 Elementary Schools and 2 Pre-Schools involved in the Unified Champion Schools Program. Rhode Island currently has over 4,000 athletes involved in more than 1,600 training and athletic competition opportunities in 21 different sports. That’s a lot to celebrate, and we want you to share in our excitement. There will be plenty of opportunities to still get involved. The 2019 Hall of Fame Induction Ceremony and Dinner on February 21st, at Twin River. Tickets are available by calling (401) 349-4900. The 50th Anniversary will be a focus of all of our events in 2018 and early 2019 and will culminate at our State Summer Games, on May 31, June 1 & 2 at the University of Rhode Island. Read about the various Sponsorship Opportunities for the upcoming events to help us celebrate our 50th Anniversary. For more information about Special Olympics Rhode Island’s events and sponsorship opportunities, please contact Dennis DeJesus at (401) 349-4900 or dennis@specialolympicsri.org.